It is that time again! Time for another author interview. 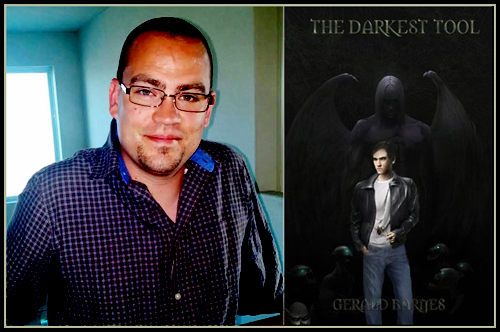 This month Gerald Barnes was kind enough to take some time out of his busy day to answer a few questions for me. You can find more information about Gerald over at Goodreads. Thank you so much, Gerald for letting me pick your brain. I can not wait to see more from you! What inspired the Darkest Tool novel? I’ve loved the horror genre since Goosebumps by RL Stine. I stepped up and began reading teen horror around third grade. I was already having vivid nightmares by then, but I never blamed them on the books. Some of those dreams stayed with me. When I was twenty one I decided that I didn’t want those images to be wasted. I began writing a novel about a guy trying to understand his nightly torments. The story was very rough and evolved from there. I noticed on Goodreads that you plan for The Darkest Tool to be part of a series. When do you think we will see another novel in this series and will we see any of the characters from the first novel, or will it follow a new main character? I’m not sure when Ill pick the series back up. I do have an idea of where Id like it to go. All the main characters will return but the story will be more focused on the struggle between Angels and Demons. Lucifer’s struggle to uphold the balance without losing credibility/respect as the leader of darkness will be a central theme. What made you decide to self-publish instead of going the traditional route? I self published because I had no clue how to go about the traditional route. It was the easiest way to get the novel out there so I went for it. Do you want to venture into other genres? As an indie author, what has been your biggest struggle? My biggest struggle as an indie author is getting exposure. It can get expensive to pay for websites like FreeBooksy or Book Bub to promote free giveaways. At this point I’ve spent more than I’ve made, but that’s ok. I love this as a hobby. If you were approached by a publisher wanting to sign you, would you consider it or do you want to stay within the indie publishing? If a publisher ever approached me id have no clue what to expect. Im pretty sure my wife and I would a lifetime moment. I couldn’t imagine not running with that opportunity. How long did it take you to write The Darkest Tool? I finished the first draft when I was 21. I didn’t back it up though. There was a party at my apartment and a beer was spilled on my computer. That was a bummer…freaking crushed me. A few years later I rewrote it from memory and you better believe I backed that up. But I never did anything with it. It sat around until I was 31. My wife stumbled upon it and encouraged me to get it out there. I contacted an editor through Elance and that’s when the story really came alive. Allsion Itterly, my editor, brought the story out I was trying to tell. She was an amazing coach. The transformation from what I submitted to her to what I published was almost unrecognizable. Thank you Allison. After finishing the first draft, how long did you spend editing before you decided to publish? I published within a day or two of completing the editing process. Editing took close to 6 months. What are some of the hardest struggles you have faced in your writing career? The only real struggle is not being able to do it full time. My dream would be to make a career out of it, something that could support a family. In reality though, at this point it’s just a hobby. I rented a cabin for three days and finished adding needed scenes during the 2nd round of editing. That was great. Really, I can write anywhere if I just sit down and make myself do it. I try not to force things though. When it hits it hits. What inspired you to start writing? Was there any one point in your life where you decided it was something you wanted to seriously pursue? I’ve always loved books. I have a fairly large collection I’m proud of and sometimes just sit and reminisce as I look over the titles. English was my favorite subject in school. It has always been a natural pull for me. I’m not sure that i have fully decided that its something I want to pursue. I mean its my dream, but my family comes first. I have to make a living. I write when I can, and when I feel its not forced. If I was forced to name only three authors…at the moment I would say: Stephen King. Pat Conroy. Christopher Moore. Are there any authors that inspired your own writing? Stephen King is a huge inspiration. I’ve read most of his books, On Writing included. When you are having trouble writing, “writers block”, what do you do to overcome that obstacle? I stop the physical act of writing and go about my life. My mind gradually works it out. Almost Anything Fiction. Recently I’ve just loved anything Christopher Moore. He makes me laugh. I imagine him as a pretty light guy. I wish I was lighter. Do you have any hobbies other than writing? Cooking and BBQ are my go to hobbies on my days off. I love to be with my family. Some of the best days are just hanging out by the pool. I live for those days actually. I love to read or be read to (audio books). I’m a slightly below average tennis player. My dad and I play when we can. I love football. Much to my wife’s annoyance I also enjoy gaming. Who is your favorite character from The Darkest Tool? I would have thought that Arioch would be my favorite character. But if I’m really be honest with myself…Lucifer. (looks up with a cringe) Phew, I’m still here. What other kind of novels can we expect from you in the future? I have a few stories rolling around in my head. One is a comedy. Another is Fantasy. And then there is the sequel to The Darkest Tool. Where do you hope your writing career will be in 10 years? My hope, my dream, my private wish…quit my sales job and work full time as a writer. By full time I mean whenever I’m feeling it and enjoying my days of freedom. As long as I could provide my family with a comfortable middle class lifestyle Id jump all over it. Until then, Sales it is. If its in you then do it. If you can see a story take shape in your head like a movie then you should give it a try. Even if its just a hobby I think you will find a deep satisfaction and pride for having followed through. Also, read. Read a ton, Study your craft. If you are a self-published author and would be interested in being my next featured author, just go over to my contact page and send me an e-mail. I love meeting new authors and finding new books.